When the economy expands or contracts, loan growth and share growth have historically had an inverse relationship. In times of economic prosperity, confident consumers take out more and larger loans. During periods of economic contraction, cautious consumers seek safe havens for their savings. In simple terms, an institution can use the loan-to-share ratio to assess how effectively it is deploying its balance sheet. A rising ratio signals that loan growth is outpacing deposit growth. As loan-to-share ratios approach 100%, institutions will commonly seek additional sources of liquidity (borrowings), sell loans off their balance, or tighten lending criteria to slow loan growth. Over the past five years, the average credit union loan-to-share ratio has increased 15.5 percentage points. In the second quarter of 2018 alone, it increased 2.3 percentage points to 82.9%. This is only 86 basis points below the 83.7% record high reached in the third quarter of 2008. 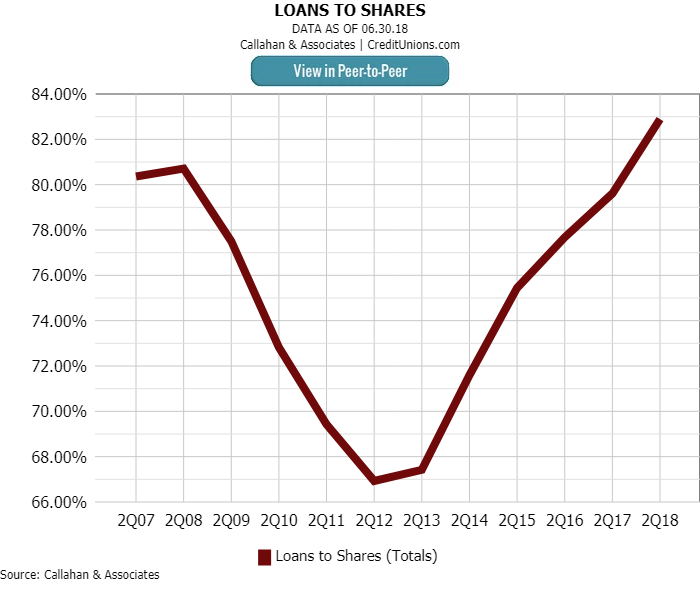 The loan-to-share ratio hit a second quarter high in 2018. As of June 30, 2018, annual loan growth of 9.8% outpaced share growth by 4.4 percentage points. Comparatively, the difference between share growth and loan growth one year ago was tighter, at 2.4 percentage points. Looking forward, experts predict the broader economy will continue to pick up stream through the remainder of 2018 and into 2019. Accordingly, loan-to-share ratios at credit unions will likely creep higher across the industry. Many credit unions are already deploying various strategies to manage their liquidity, including selling first mortgage loans to the secondary market, selling loan participations, and relying on borrowings and other lines of credit. As the economy continues to grow, credit unions must have not only a healthy risk appetite but also healthy deposit growth strategies to ensure an optimal liquidity position for their institution. It takes minutes to compare various aspects of an institution’s loan-to-share ratio against other credit unions with Peer-to-Peer. Let Callahan walk you through your numbers with a custom performance audit.